Vous visiterez deux des gratte-ciels les plus impressionnants de Kuala Lumpur pour un seul prix avec cette entrée combinée aux tours jumelles Petronas et à la Kuala Lumpur Tower. En préréservant vos billets, vous pourrez éviter les files d'attente et sélectionner votre horaire préféré pour les tours jumelles Petronas (il y a un nombre limité de billets disponibles chaque jour). Ces deux tours comptent parmi les plus hautes du monde et offrent des vues panoramiques sur la capitale malaisienne. Les plus hauts immeubles du monde jusqu'en 2004, et toujours les deux plus hautes tours jumelles, les tours jumelles Petronas sont une attraction incontournable de Kuala Lumpur. Votre billet préréservé vous donne accès à l'heure de votre choix (à sélectionner au moment de la réservation) pour visiter la terrasse panoramique à une hauteur de 170 mètres. Les meilleures vues sur Kuala Lumpur sont doublées avec votre entrée combinée à la Kuala Lumpur Tower, qui est la septième plus haute tour du monde. La terrasse panoramique y est plus haute que celle des tours jumelles Petronas et offre une vue à 360 degrés sur la ville. Les billets officiels seront remis dans les hôtels ; les autorités de la tour ne sont pas responsables de vos billets. Les tours jumelles Petronas doivent être visitées à l'heure de votre choix ; la Kuala Lumpur Tower peut être visitée à tout moment le jour de votre réservation de 9:00 à 20:00. Received our tickets in our hotel one day prior to visit. Went to both towers at sunset. Views were amazing. Highly recommended! Received our tickets in our hotel one day prior to the visit. Went at sunset to both towers. Views from the twin towers and sky bridge at Petronas and KL Tower were amazing. Highly recommended! The tour itself was great BUT we didn't get tickets 24 hours before as promised. We had to send a number of emails and had to wait in hotel lobby for tkts to arrive on the day. Poor comms and when tkts arrived they were for way earlier than purchased which spoilt our plans for day. Just go direct. Definitely worth pre booking especially if busy season - tickets delivered as promised night before. Petronas Twin Towers excellent however the Observation Deck at KL Tower a little disappointing and would have been good to experience revolving restaurant as well obviously possible at extra cost but time for us didn't allow. 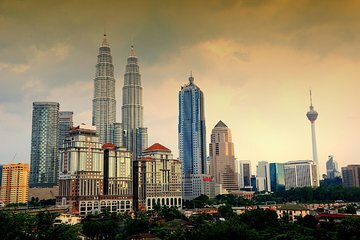 This dual tour is the best value for money to see Kuala Lumpur from above. Prebooking your tickets takes the fuss away but if you have time, there is a board that tells you what times are available so in offseason not always necessary. Although most people opt to visit the Petronas Twin Towers in the evening to watch the sunset, and KL Tower during the day, I would suggest doing the opposite. Definitely visit the Petronas Towers first. The KL Towers second or you may be disappointed. The Twin Towers are impressive, new shiny ... it almost seems more spectacular from the ground below. The photos more dramatic. But from inside, you looking from behind glass. However, upgrade to the top deck at KL Towers and you are outdoors, there's a glass floor platform to challenge the faint hearted, a coffee shop to sit and enjoy a lovely snack seriously expensive, but the view and atmosphere makes it worth it. And you look down on the Petronas observation deck! If you only have time for one tower visit, the Top deck KL Tower would be my choice! There is no time limit so go up while it is light and stay for sunset! Take the Hop On Hop Off bus. There's a revolving restaurant so book a meal, if that takes your fancy! We found Booking through Viator effortless and a great experience, we use them everywhere we travel, takes the stress out of sightseeing... you get what is promised! Well worth purchasing these tickets before arriving in KL although visitors take note the KL ticket does not allow access to the top of the tower and we had to make an additional payment. It was worth paying the extra all be it annoying as there is a lovely café at the top and it outside and the skywalk platform was amazing. The Petronas towers are great and the guide was very informative and helpful. You are limited to time on this tour at the bridge and at the top but there was plenty of time to take photos and read the story. Eintrittskarten für Kuala Lumpur Tower Observation Deck nicht nutzen, die wir hier nur Eintrittskarten für KINDER bekamen! Even though we had tour at Sky bridge and observation deck but Sunset view was really amazing! Not easy to get on the spot due to availability and long queues. Thank you Viator!